England's Danny Willett fears 'Armageddon' at the Open Championship if Friday's wind and rain proves as bad as has been forecast. Willett shot a six-under-par 66 to be the leading English golfer after round one and is one stroke adrift of the lead held by America's Dustin Johnson. The Rotherham golfer told BBC Sport: "It could be Armageddon-type stuff by the looks of the weather forecast. "When the wind and rain gets up it can be a lottery." The 27-year-old added: "The amount of wind there was today you can play it. If you play good golf, there's a birdie chance on every hole. But, when it gets to be much worse than that and it's raining too, then it makes it very tough." Coverage: Live across BBC TV, Red Button, Connected TVs, online, Radio 5 live, sports extra, tablets, mobiles and app. Willett, who ended the first day as the leading Englishman, began well with three straight birdies to go out in 33 before the highlight of his round - an eagle two when he chipped in at the 386-yard 10th. He immediately suffered his only dropped shot at 11, but two more birdies, at the very tough 13th and at 18, brought him home also in 33, matching twice former US Open champion Retief Goosen's best back nine of the day. "It was a tough day with the wind pumping," added Willett. "But I hit some solid golf shots. "It was hard to get close on the back nine, so to go three under is pretty good. And that walk up 18 is pretty special. There were a lot of people still in the grandstands, even though it's cold and windy, which was really nice." 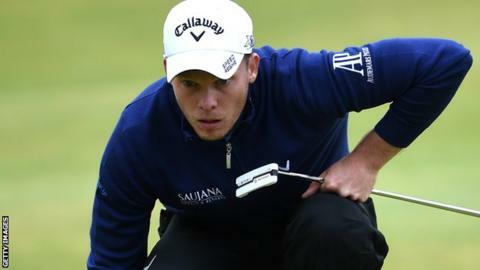 Willett went into the tournament standing second on the European money list this season, having doubled his number of victories to two when he won the Nedbank Challenge out in South Africa. As to whether he now has the game to go on and win a big one, the Sheffield-born vicar's son has no need for the power of prayer - more the growing confidence he has in his own game. "My game's been there for a while," he said. "The more you play with the guys the more you realise they can't do anything much better than you can, if at all, and that I'm actually equipped to do pretty well. "In a major championship, you need a little bit of luck and to hit the right shots at the right time and, if it's your week, it's your week."